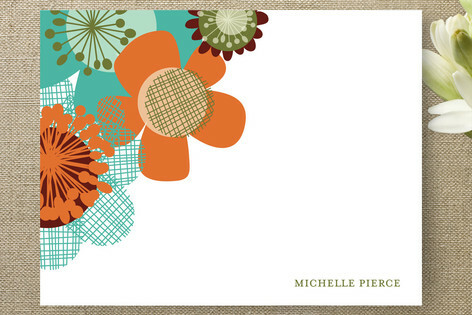 These personalized stationery cards give your note a sassy retro feel, accented by bold patterned flowers perched atop the corner, and your name placed subtly below. 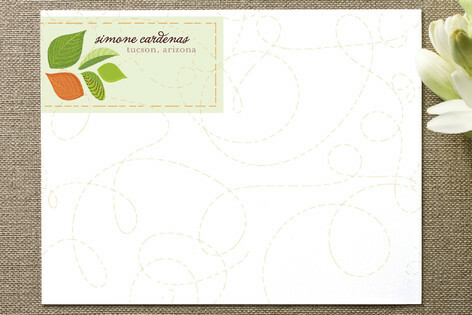 A sweet and fun set of colors zip themselves together up and down the side of these personalized stationery cards, pausing only to show off your name. 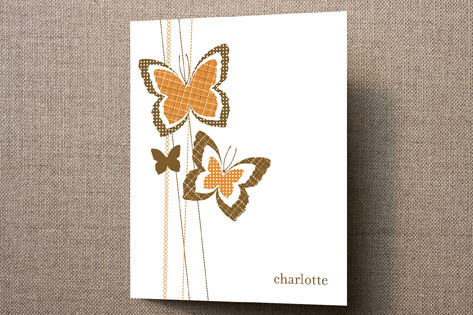 Three patchwork monarchs flutter up the side of these personalized stationery cards, adding a sweet and modern flair of fun to your notecard. 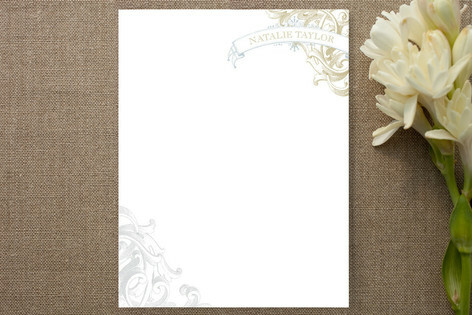 These clean and elegant personalized stationery cards proclaim your name in bright, bold letters, creating the perfect environment for a handwritten note to send on any occasion. 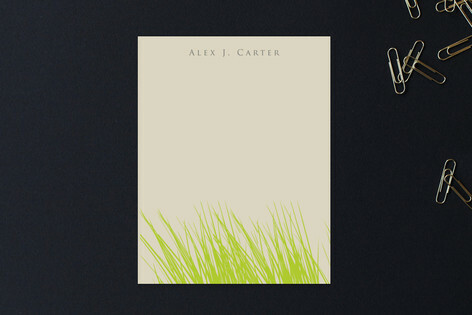 Bold leaves of grass create the bright landscape for these foldover personalized stationery cards, with natural tones fit for a writing adventure. 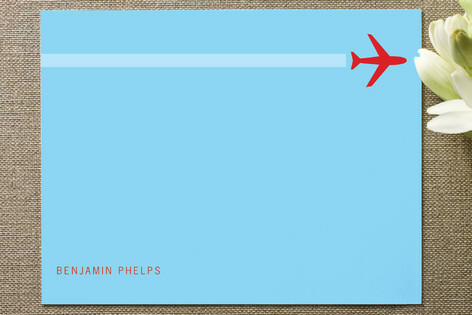 Perfect for the avid traveler or jet-setter, these flat personalized stationery cards feature an airplane soaring across the top of the card, with your name placed firmly on solid ground. 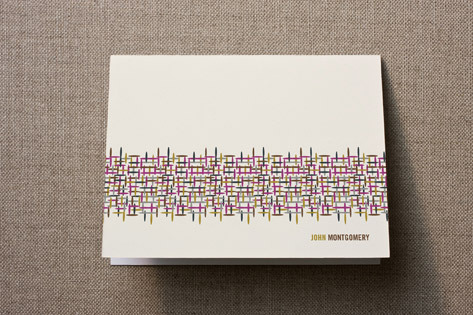 With unique designs printed on luxe paper and a complimentary gift box, personal stationery is a chic way to stay in touch. 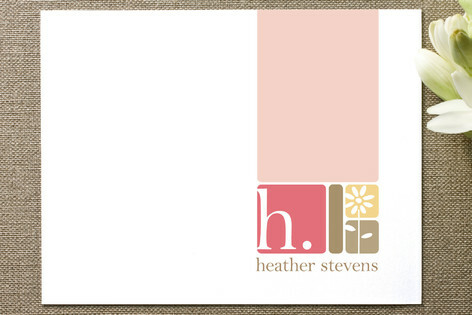 If you have any questions or special requests for your stationery, let us know how we can help at customerservice@minted.com. 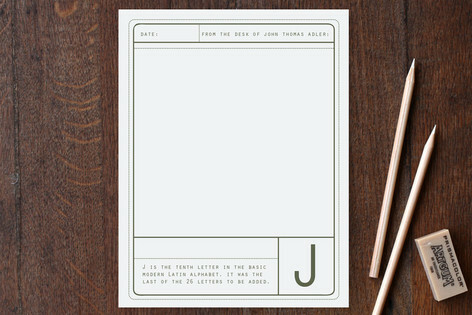 Give your recipients the whole scoop on the origins of your initials with these thought-provoking and informational personalized stationery cards. 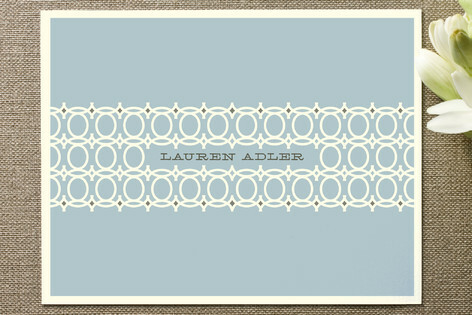 Beautifully ornate and elegant, these personalized stationery cards lend decorative edges to your handwritten note. 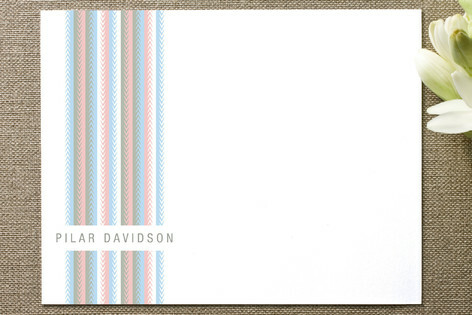 A bold and fun striped pattern gives a versatile setting for your handwritten note in these personalized stationery cards. 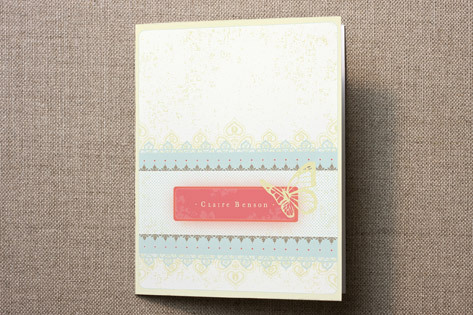 This fanciful children's personalized stationery is like tall tales of adventures ready to begin. 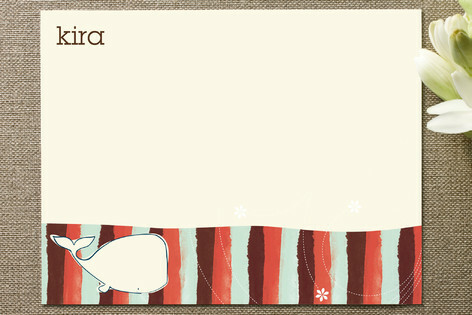 A hand-drawn, vintage whale swims the ocean depths, awaiting your childâ€™s message. 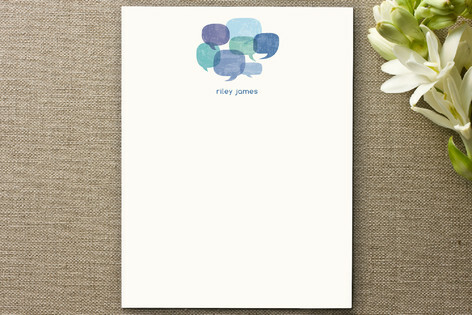 A little bit retro, a little bit cartoon; a cluster of mod speech bubbles float above your child's name, leaving plenty of room below for all the things that can't wait to be said. 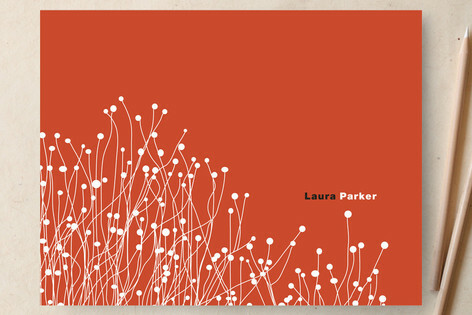 This playfully illustrated design remains classy and smart. 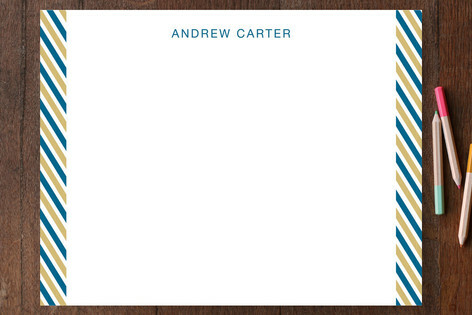 Substitute a more linear or editorial typeface using our online personalization tool and you might even want to order a set of these children's stationary for yourself! 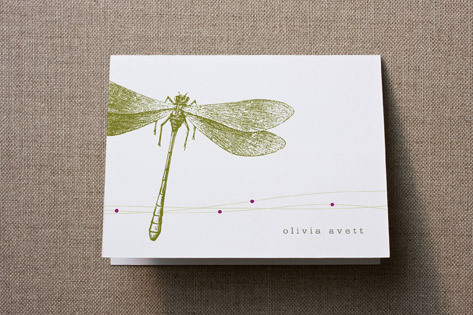 A beautifully illustrated dragonfly is the centerpiece of these foldover personalized stationery cards, serving as an invitation to read your handwritten note inside. 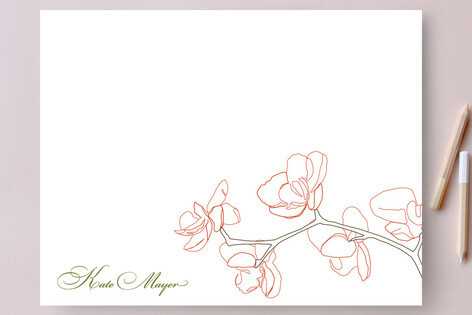 Faint trails of windblown leaves trail across the backdrop of these personalized stationery cards, which include an illustrated label with your name, location, and brightly colored leaves above. 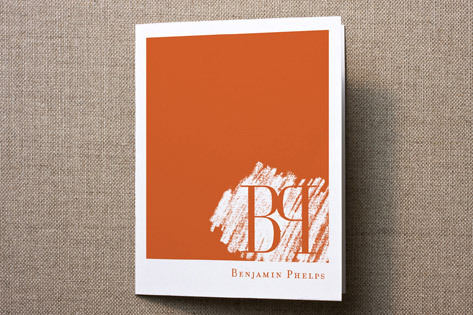 These foldover personalized stationery cards display a "new antique" pattern, with classic curves and ovals surrounding your name boldly printed on the cover. 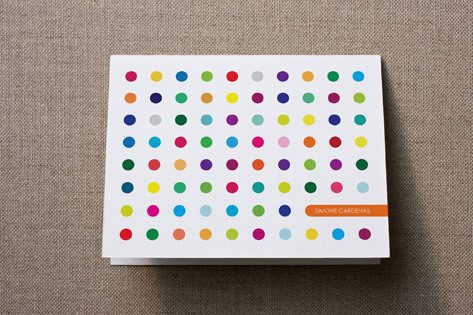 Bright, bold, and fun, these foldover personalized stationery cards feature multi-colored dots across the front of the cards, reminiscent of the sugary buttons from an old-time candy store. 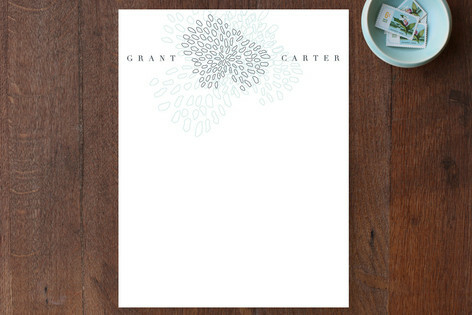 Modern and fun, these monogrammed personalized stationery cards feature your initial perched atop a bright energetic band of dots and lines. 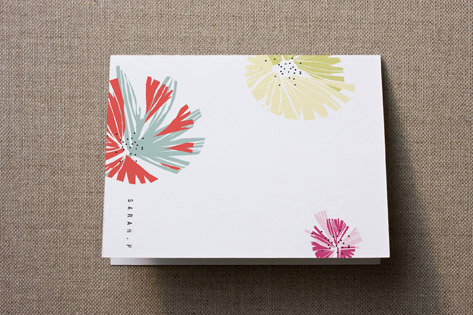 Bold, graphically illustrated flowers spread across the front of these stylish foldover personalized stationery cards, providing a rich textured feel to your correspondence. 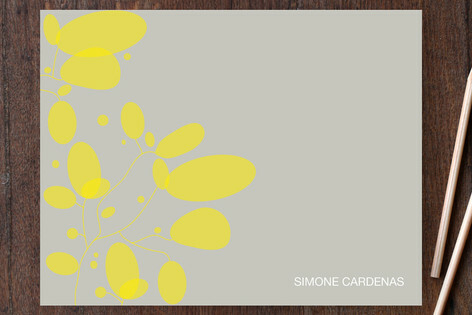 Boldly crafted "paint splashes" give the impression of pressed flowers on the front of these dynamically illustrated personalized stationery cards. 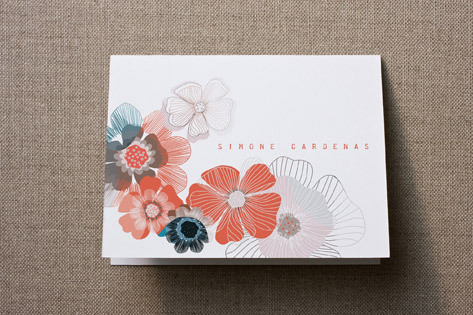 A pop of mild color highlights the top of these personalized stationery cards, as a bold centerpiece to your name. 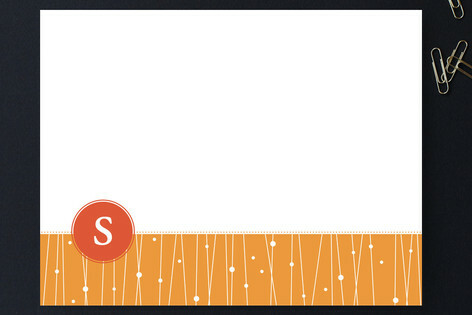 With the nostalgia of well-used fabric, these foldover personalized stationery cards put traditional patterns in fresh perspective, delicately blending modern and vintage symbols. 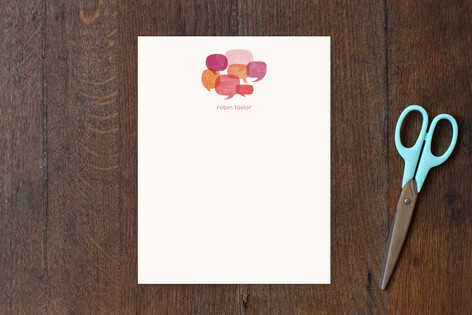 Bright blocks of color and a sweet flower icon surround your first initial in these stylish personalized stationery cards, providing a bold yet feminine complement to your handwritten note. 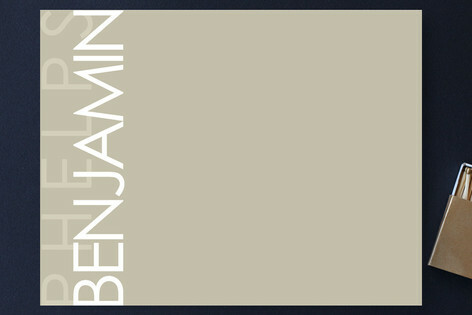 Alternating bright and neutral stitches of color form a textured band across the front of these foldover personalized stationery cards, visually sewing your name in to the design. 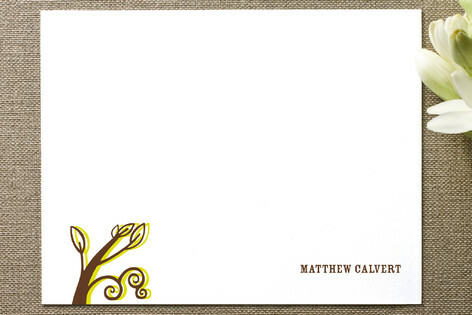 A boldly illustrated tree branch with a solitary piece of hanging fruit bows across the front of this foldover personalized stationery card, giving your correspondence a fresh personal touch. 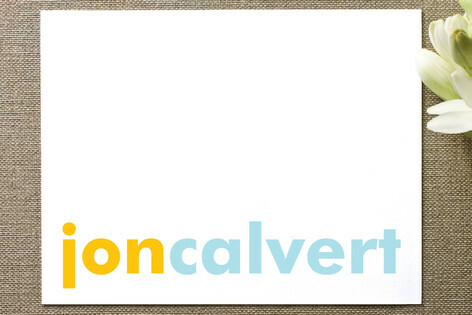 Reversing the typical interpretation of erasure, these foldover personalized stationery cards "erase" the area around your initials so they stand out in a classic, yet modern typeface. 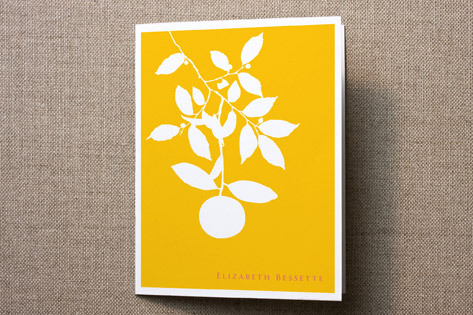 Bright and fun, these personalized stationery cards feature a growing sapling with such a strong shadow it almost seems duplicitous, but is a perfectly modern emphasis for your handwritten correspondence.